I’m currently working on a review of a CD compilation by The Undertones for the Illinois Entertainer. While listening to their frenetic but highly melodic “Teenage Kicks,” I realized that I sometimes get it confused with this record. Several years ago, I made a mixed tape where “Teenage Kicks” followed after “Teenarama,” and by now the two songs are fused together in my mind. The B-side, “Held Up High,” is a non-LP track, also written by Wicks and Birch. The soaring harmonies and Brown’s adventurous bass playing add to this appealing song’s psychedelic ambience. 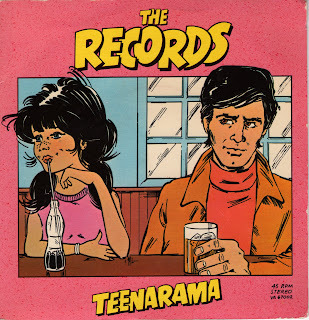 I've a great 1:12 jingle by the Records using Teenarama imagined as a Coca-Cola commercial. "Coca-Cola...sweet lil rock n roller...gimme gimme gimme gimme gimme gimme gimme gimme Coca-Cola!" These guys were/are a priceless gem in the powerpop genre...and John Wicks is a really great guy.